A little background before you dive in . . .
MECH (Middle East Coexistence House) consists of an entire floor in a Douglass College residence hall that brings together up to sixteen young women from diverse backgrounds to promote women’s involvement in international conflict resolution and negotiation. 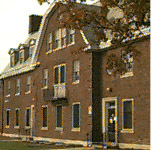 Jameson Hall, a women’s residence on the Douglass College campus of Rutgers University in New Brunswick, New Jersey. Danielle Josephs of Teaneck, New Jersey, when she was a senior in 2006. Learn about the Middle East and ultimately improve Jewish-Muslim relations; Also serve as an ambassador in her own community, spreading the values of mutual understanding, mutual respect and coexistence. Description: This course is designed to explore the complexities of a contemporary conflict and introduce students to the concepts, theory, and practice of community building, peacemaking, and conflict resolution in the context of the Middle East. Through case studies, class presentations, and group projects, students will develop the ability to analyze conflicts, as well as make recommendations for change. Posters and photos of key figures from all faiths. Jewish, Muslim, Hindu, Christian, Agnostic.